Registration full - click here to join the Waitlist! 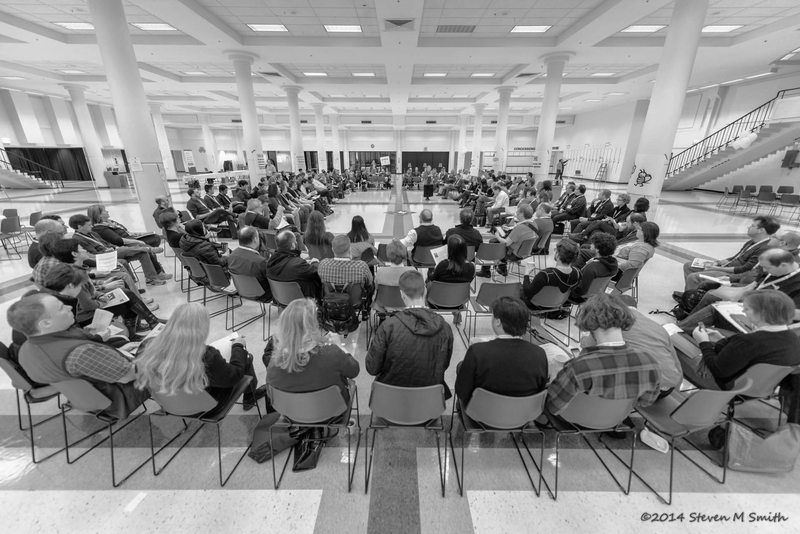 Agile Open Northwest is proud to present our 13th Annual AONW conference on February 6-8, 2019 at the Leftbank Annex in Portland, OR. The theme this year is "Finding Our Agility in the Unheard Voices." We are dedicated to a low-cost conference, and are pleased to hold the rate to only $295 for the 3-day event. Registration is now open using the button above! Don't forget to check out all the details about AONW 2019. You can also follow us on Twitter or join our email interest list to stay up to date with all the latest info. 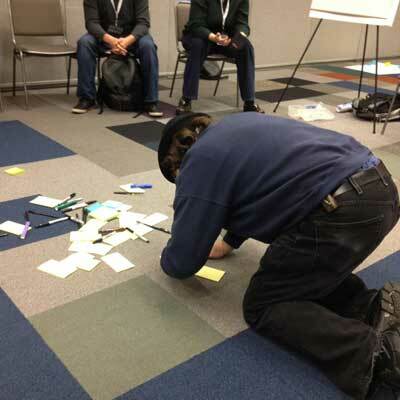 In addition to hosting our annual February conference about agile practices and techniques, Agile Open Northwest sponsors and hosts other events that focus on agile topics, use Open Space, and occur in the Northwest United States. As soon as the next one is scheduled we will announce it here, and on Twitter. Thank you to all who attended AONW 2018 in Seattle. You can still view session notes or other details about the 2018 conference. AONW is an annual conference about agile practices and techniques. 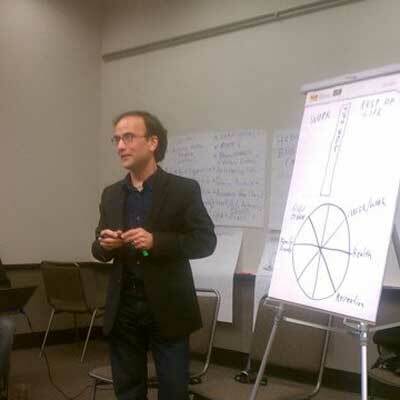 Using Open Space, the participants themselves make the conference they want to attend. Come prepared to share your latest ideas, challenges, hopes, experiences and experiments! Inclusive but intimate, Agile Open Northwest is limited to less than 300 participants. 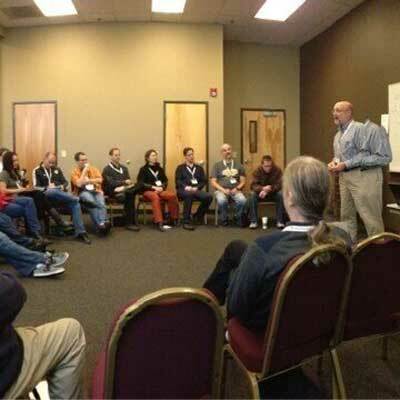 The opening session of Agile Open Northwest takes place on the first morning, with everyone attending. Your commitment to arriving at the beginning and staying until the end of the conference will ensure we build on conversation after conversation. During the opening session, a host will explain the Five Principles and One Law of Open Space. If you have questions, volunteers and hosts will offer answers. After the introduction, we will invite those who want to convene a session to come forward and present it. It’s a simple process. You don’t need to prepare papers, slides, or flip-charts. You will simply step forward and briefly describe the session you propose. You’ll include just enough information to let people decide whether to attend…and no more. Generally, you need less than thirty seconds. After presenting a summary of your proposed session, you’ll select a time and place and post a notice on our Marketplace wall. As each person does the same…Voila! The agenda is born. We ask that everyone attending our conference show up for the opening. It’s important. You’ll listen to the presentations and take note of those you would like to attend. As you listen, you may be inspired to present a session yourself. There are no deadlines or time limits: simply step up and describe your idea for a session. At the end of the presentation, you will browse the notices on the Marketplace and sign up to attend any sessions that interest you. Signing up for a session is optional. You may attend any session you like and even move between sessions (according to The Law). You may add a session to the schedule at any time during the event by posting information about it in an available slot in the agenda. We’ll have periodic announcements of any new or rescheduled sessions, but it’s a good idea for all participants to keep an eye out for schedule changes as well. Who can create an Open Space session? 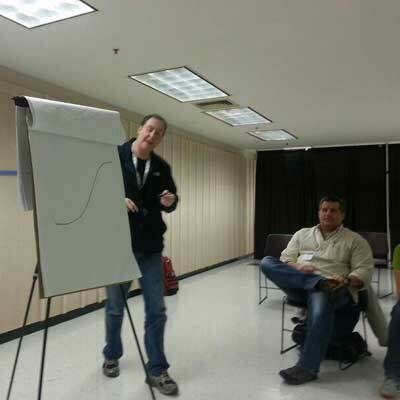 Anyone attending Agile Open Northwest may create a session. 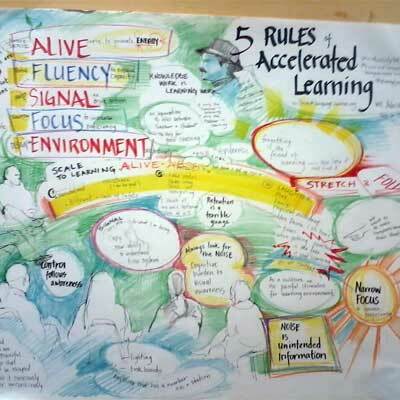 What topics are suitable for an Open Space session? Any topic related to our conference theme is appropriate. Sessions may be on technical or non-technical subjects, but should relate to working with agile methods in the real world. Do I have to be an expert in the topic to host a session? No, session conveners only need to have the level of expertise needed to conduct the session. If you intend to teach other people about something, we hope you actually know something about it. But you may choose to conduct your session as a discussion among peers or even organize a session around a topic that you know little about but would like to understand better. Be sure to explain how you intend to conduct the session when you invite people to attend it. Can I add a session after the Opening? Yes, just speak to one of the hosts. We will have announcements of new sessions and changes at the start of each day and during lunch. Will there be a record of sessions? We publish simultaneously with the conference an online record of what sessions were held, who participated and what happened in them. The level of detail of this summary is up to the session hosts; at the conference, instructions and assistance will be available so that you can enter session information while it is fresh. Can we schedule sessions in the evening? We have optional night-owl sessions on the schedule in the evenings. We must leave the facility before closing time… but wherever it happens is the right place, so you can schedule sessions in other places like coffee shops, restaurants, or bars. Use your imagination. :-) We also have early bird sessions at 8:00 am for those who prefer the bright light of morning. We’ll have a continental breakfast and lunches each day, and one dinner provided at the venue. There are also a number of restaurants within easy walking distance. There are a number of hotels nearby. At the time of this writing, we are working on arranging special rates at nearby hotels. See the Location section and follow our tweets for more info. What equipment is provided for the sessions? All the rooms will have easels with flip-chart tablets, markers, and some sticky notes. Why did we add a third day? The first half-dozen AONW two-day conferences were packed with sessions and filled to the limit. Your hosts felt that adding a third day would be a chance to broaden the community. It turns out that when you have two nights to sleep on something, the magic really begins to happen the third day…and so we expect new sessions to be added that morning that grow out of what happened the first two days. Past attendees can tell you that some of the most interesting discoveries happen during dinner, and now there are two opportunities for that. And lastly, we’ve found having a retrospective on the conference afterwards provides us with the best ideas for next year…and now you can join us in contributing to that learning. How do you set the registration price each year? We try to keep the cost of registration as low as we can, so that attendees can pay their own way if they must. Prices for suitable venues and food change every year, and have risen in recent years. We’re grateful that our sponsors help keep registration prices low. Why doesn’t AONW offer refunds? In recent years, AONW has sold out, often well in advance of the event. We emphasize our no-refunds policy because each year, we receive multiple requests for refunds from registrants who maintain they didn’t know we have such a policy. Why do we have the policy? We’re a non-profit with limited financial resources, and we have to pay over $65,000 in fixed and non-refundable expenses, mostly well in advance of when the event occurs. Without the money our early registrants provide, AONW would be impossible. The requests for refunds tend to come in the last few weeks before the event, after we’ve already booked caterers and don’t have an ability to adjust…and most those on the waiting list are no longer able to change their plans to attend in the place of someone seeking a refund. All this means that we won’t be able to offer a refund or a transfer to another event. You can substitute a different attendee at any time up to the start of the event. See “How do I substitute a different attendee?” AONW has for years now had a no-refunds policy. The policy is presented in Eventbrite during the purchase stream, in the email purchase confirmation, and on the electronic or paper registration itself. Having said that, nearly no one notices the policy. We wish we could figure out how to make this even clearer, so we’ve added notices of the policy even more places, and created this FAQ answer. How do I substitute a different attendee on my registration? To substitute a different attendee on the Eventbrite site, all you need to do is log in to the Eventbrite account you used to purchase the registration, then change the attendee name, email address, and company name to the new attendee. We’d also appreciate having the new attendee answer all the questions we ask. Here’s some help on doing that: howToTransferTickets. There’s even a tutorial with pictures that might help make this easy. Forgot your login info? The article helps with that, too! What that ends up doing is changing the information that matters for registration - the name on the badge, the survey questions, address, and so on. If you’re still having trouble, contact AONW Registration registration@AgileOpenNorthwest.org.